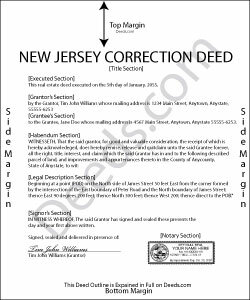 Use the corrective deed to correct an error in a previously recorded warranty, special warranty, or quitclaim deed in New Jersey. Once a deed has been recorded, it cannot be changed and remains part of the public record. It is possible, however, to amend that record by adding a newly executed deed. The method used depends upon the reasons for changing. For corrections or omissions in the existing deed, file a corrective deed, or re-record the original deed after making the changes on it. In order to include/omit a name from the existing deed, however, a new standard conveyance, such as a warranty or quitclaim deed from the current owner (instead of the original grantor), may be more appropriate. The errors usually adjusted by a corrective deed are minor omissions or typographical mistakes, sometimes called scrivener's errors. Among those are misspelled names, omitted or wrong middle initial, a minor error in the property description, or an omitted execution date. The corrective deed, also called deed of correction or deed of confirmation, must state that its sole purpose is to correct a specific error, which is usually identified by type. For example: an error in the grantor's name, or an error in the grantor's marital status. The latter might also require an additional signature by the grantor's spouse in the acknowledgement section of the deed. In some counties, it is common practice to re-record the prior deed and to make the correction, error identification and reference to the earlier recording on the face of it. The entire deed, including new signature and acknowledgement page(s), must be re-recorded for new fees. As with the prior deed, the corrective deed (or re-recorded deed) must be accompanied by two copies of the affidavit of consideration (RTF-1 form), identifying and explaining the exemption under #4. In addition, submit the GIT/REP-4a form, which is a tax waiver form for corrected deeds without consideration. Download both forms from the website of New Jersey's Department of the Treasury.